A few weeks ago J attended a marathon bat mitzvah in which we dropped her off at our local neighborhood temple and picked her up roughly 3 weeks later up in Saratoga. Okay, you’re right, it wasn’t three weeks later–I’m exaggerating–but it was, like, seven hours later, which seems to be a truly courageous length of time to willingly assume custody of a passel of adolescent girls. I mean, doesn’t it? I suppose that, with enough chicken fingers, inflatable guitars, and a very loud deejay, one can avoid restroom weeping and/or rioting. And I’m only supposing because we barely slowed down the car at drop-off and pick-up. Anyway, we hardly ever get to Saratoga. I don’t know why. It’s a lovely place. I guess that we’re too close to be tempted to act as tourists and too far for a casual lunch. So when we needed to schlep up and retrieve J in the evening, Cute W and I decided to treat ourselves to an early dinner date at The Merry Monk. Okay, yum. I didn’t intend to write about it, necessarily, but then everything was delicious and I could not, in good conscience, continue eating without taking a photograph first. Cute W very patiently disengaged his hungry hands from shellsville while I tried to make things look presentable for an image to share. Ta da. 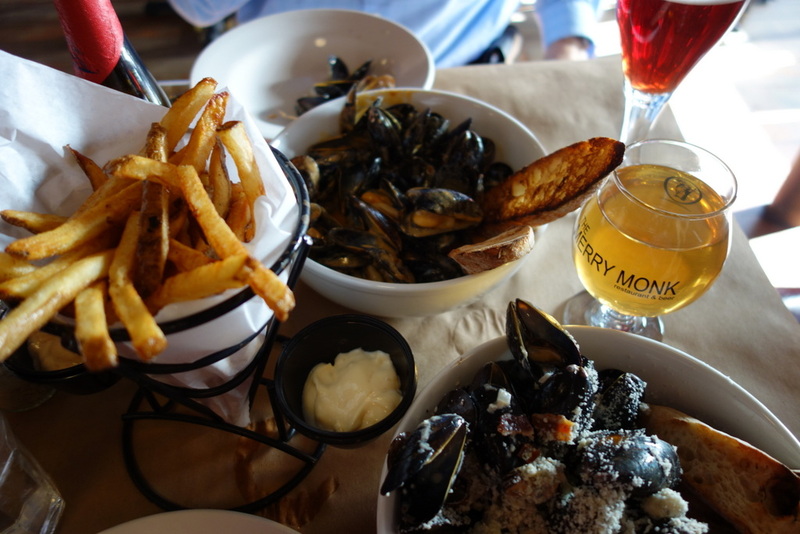 Our picks from the menu were the Americana mussels, with bacon & blue cheese; and the Classic Meuniere mussels, with butter, garlic, and white wine. We went with the Chipotle and Roasted Garlic mayos for dipping the frites. I think that whenever we go back next time, I’ll want to order the exact same thing. Not because there aren’t other great choices, but because it was all so very delicious, I don’t think that I could return and not want them all again. I don’t know what it is about Moules Frites that makes me love them so. Part of it, I think, is that Belgian food was enjoying a minor heyday in New York City when we were living there, after we both left school and started working and actually (barely) had enough money to eat out once in a while. So those frites aren’t just dipped in mayo: they’re lightly salted with nostalgia. I also love, love, love mussels. Pretty much anytime we go out on a date, if mussels are on the menu, I want them. Which is peculiar because I can be a little bit fussy about seafood. I like a tuna fish salad, but only when it’s more celery than tuna. I keep trying–and failing–to like clams, oysters, and salmon. Talking about fishiness that I love and fishiness that I hate reminded me of a couple of fish stories. First, fish I hate. Salmon. I know, you guys. It’s really good for us. Normal adults like salmon. I would like to be a normal adult. I’ve tried and tried, but ewwwwww. No. So, long ago, when Cute W and I were dating, we went on a trip to Colorado so that I could meet his extended family. At one dinner, his grandmother served salmon, and I did an amazing job of eating it all and smiling and chatting and acting like I thought it was delicious. And then the next day we sat down to lunch, and guess what was on the menu? Salmon loaf, made with the leftover salmon! My reward for an excellent performance. And now: fish & chips. I like fish & chips, but only if it’s really excellent fish & chips. You won’t find me picking up those frozen fish sticks, like ever. Same thing with crab cakes: I often find that I like the idea of crab cakes more than actual crab cakes, but I think that’s because they’re often not cooked well. I’m spoiled because my Dad is so good at making seafood, so I can’t just eat average stuff. Come to think of it, I’ve spoiled my children for most cookies for the same reason (if I do say so myself). But, anyway, back to the fish & chips. When we lived in Brooklyn, along with enjoying the Moules Frites Heyday, we were fortunate to live just down the street from The Chip Shop. Oh, it is delicious. Oh, my gosh. The Park Slope location, the original location down the street from our old apartment, has shut down. Apparently the other location is still open, but I need to take a minute here. A moment of silence, if you will. I’m alright. [Wipes eyes.] No, really. It’s fine. I’m fine. Okay, so The Chip Shop was a favorite of ours. Now, for our last months in Brooklyn, I was pregnant with M. Backstory here, if you don’t already know it. At the time, I had a job working as a museum educator at the Dyckman Farmhouse Museum which is approximately way to hell and gone, otherwise known as a one hour and fifteen minute-long subway ride from our place in Brooklyn. I loved that job and I had a wonderful time, even when my boss was sure that I was going to go into premature labor from climbing too many stairs. But the subway ride became difficult. I was always starving by the end of my busy workday. Sometimes I’d run across the street and pick up a snack at the grocery store so that I could scarf it down on the train. But as time progressed, reasonable snacks just weren’t enough, and the meals that I would try to juggle along with my book and my belly just got too unwieldy for the train. I remember one embarrassing episode that involved a massive baba ghanoush spillage. So then I tried to hold out until I got home. In the train, I’d fantasize about whatever food I was going to eat, then I’d arrive home and eat a massive feast, then I’d fall asleep until Cute W arrived home from work, at which point I would act as if I hadn’t just eaten a meal, and we’d start cooking our dinner. Once I spent the entire train ride home thinking about the leftover Chinese food in our fridge only to discover that Cute W had dumped it. He trashed my Chinese food, and Oh Hell Yes He Knew My Wrath. To this day, Cute W is afraid to throw things away without checking with me first. But on another day, somewhere around 49th Street I decided that I needed fish & chips and nothing else would do. Which was about par for the course, except that this time, Cute W unexpectedly arrived home early. He opened the door to see me hunched over a massive spread of greasy newspaper covering the entire coffee table, malt vinegar spotting my smocked belly, cod becoming oily and rank as the remains of my feast cooled, and fists clutching limp fries. Cute W recounts the story by saying that my expression screamed, “Don’t look at me! I’m hideous!” I remember his expression clearly, too, and the best way to describe it is: imagine that we’re both characters on the Walking Dead and Cute W stumbles upon me feasting on a small child’s intestines. Of course, he recovered himself quickly and slapped a smile on his face because, of course, He Had Done This To Me and he was still terrified after the Leftover Chinese Food Incident. At that point, the jig was up, and he knew about my 4th Meal, which came well before Taco Bell’s. Luckily, we moved shortly thereafter. And a good thing, too, because that 90-minute commute was getting way too long for my nine months’ pregnant bladder. Oh my god. The tears are rolling down my face from howling laughter. Thanks for the memories! I read this to Jake. We laughed all the way through it. 4 stars! So glad to know there is a Merry Monk in Saratoga. We love the North Pearl St one. And I am VERY sad to hear the The Chip Shop on 5th Ave has closed! I’ve been reading your blog for years and knew you moved to the region from NYC, but you must have lived around the corner from us! We lived a block from The Chip Shop and I ate there regularly when expecting our 12 year old. It spoiled me for fish and chips in the Capital Region. I bet you went to Coco Roco too, which a quick Google search tells me is still there. I miss the 5th Ave Park Slope of the early 2000s. But not navigating long subway/walking commutes while very pregnant! @Erin, that’s so funny! And that means it was at the same time, too! Yes, loved Coco Roco, and the very small burger joint with fries and chipotle mayo.. . . mmmm.